Fiercely feuding over Syria, Russian President Vladimir Putin met the top American diplomat in Moscow on Wednesday to see if they could rescue relations between the world’s mightiest military powers. Russia’s alleged meddling in the U.S. presidential election also hovered over the first face-to-face encounter between Putin and a Trump administration Cabinet member. Leaving traveling U.S. reporters across town, Secretary of State Rex Tillerson met Putin in the Kremlin for almost two hours following fraught discussions with Foreign Minister Sergey Lavrov. The chief dispute concerned the Syrian government or opposition’s culpability for a chemical weapons attack that killed more than 80 people in Syria last week, though broader disagreements over everything from Ukraine to Russia’s support for once-fringe candidates in European elections are among other sore points between the former Cold War foes. 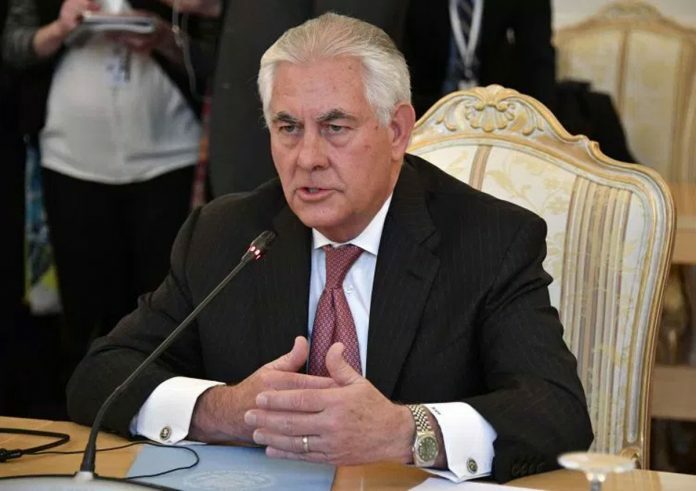 Steeped in geopolitical intrigue, the meeting between Putin and Tillerson wasn’t formally confirmed until the last minute, following days of speculation about whether the Russian would refuse to grant the former oil executive an audience. Putin’s decision to host Tillerson signaled Moscow’s intent to maintain communication with the U.S. even as they bash each other publicly in louder and louder tones. The men know each other well from Tillerson’s days as Exxon Mobil CEO. Putin had even granted Tillerson with a friendship honor. Unlike he has done with previous secretaries of state, Putin didn’t keep Tillerson waiting for hours on Wednesday. The Russians held to a tentative schedule that was worked out in advance, U.S. officials said. They weren’t authorized to discuss diplomatic conversations publicly and requested anonymity. The meeting agenda wasn’t announced. The U.S. and Russia have sharply disagreed over whether Syrian President Bashar Assad’s forces or rebels were responsible for the chemical weapons attack last week that led to U.S. retaliatory cruise missiles. Washington says it has no doubt about Assad’s responsibility. Putin has spoken of having proof that it was a “false flag” operation intended to rally international opposition to Assad. Before meeting Putin, Tillerson received a chilly reception from Lavrov, who told Tillerson that Russia was trying to understand the “real intentions” of the Trump administration. Tillerson conceded the two world powers had “sharp differences” that have obstructed cooperation but voiced optimism they could make progress. In the U.S., Trump sought to tamp down speculation he’ll intervene militarily against Assad, who is being backed by Russian forces. Trump told Fox Business Network that his strikes were solely because Assad used chemical weapons. Turkey has said tests showed sarin gas was used. U.S. intelligence agencies have said similar. Russia, Assad’s staunchest ally, has insisted the Syrian leader is blameless and that rebels disbursed chemical weapons. The palpable tension hanging over Tillerson’s trip spoke to a widening chasm between the two world powers. Tension Rise over Syria as Putin Met with Secretary of State Rex Tillerson on Wednesday in Moscow in the first visit by a Trump Cabinet official.